After two days of thinking about Indonesia, I had a craving for that most un-Indonesian of foods…pork. Being in Japan, I thought I would see about one of the local food crazes right now, tonkotsu ramen or ramen noodles in a pork broth. (Not to be confused with pork bone tea.) 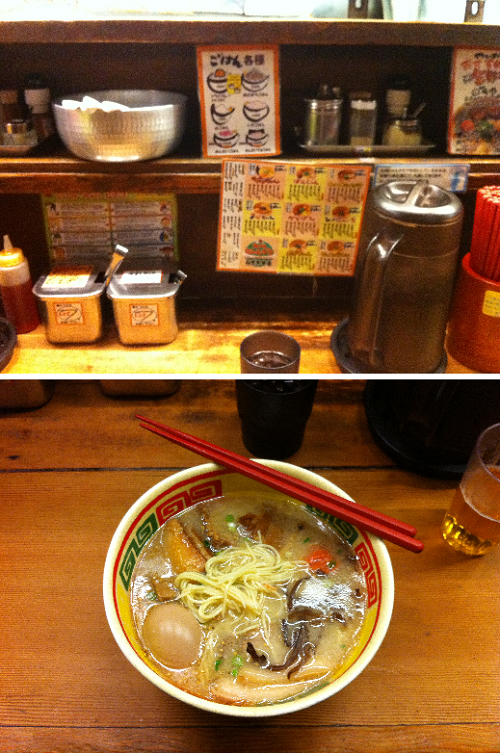 I found a number of reviews that suggest that the best place to try this is at Kyushu Jengara Ramen, which has a couple of outlets around Tokyo but which has its main outlet in Akihabara, a neighborhood of comic books and videogames and disturbing young girls in maid uniforms. I went, joined by a colleague from UCSD, and ordered the kobonshan (medium-fatty) soup zenbu iri, or with everything it: slow cooked pork belly, roast pork loin, spicy codfish roe, hardboiled egg, and some other weird stuff. The reviews were correct. This is fantastic, and incidentally it is also probably the most efficient fat and salt delivery system out there. But my very favorite thing about the place is that if you want more noodles, all you have to do is yell “kae dama!” and they come by with more ramen for your broth. Genius. That looks pretty tasty to me. Sounds like a fun experience.